I've been Flying for awhile over Coffs Harbour and Tamworth Australia, and the SDI C4 Variometer and the Audible Vario Sound ALWAYS indicates that I should get out of sinking there (always a low, long beep, and always downward needle pointing on the C4). I know this is probably because I'm just Flying over the city, but when I went towards the hills there was minimal change in the Vario Sound/Indication). This may be to do with thw weather conditions I'm using? I'm using a few Cumulus with some higher level Stratus in Medium Warm conditions and small winds. Please could somebody reccommend some ideal conditions for thermalling? Cheers. I have WinchX, and (I think, please see below) I have CumulusX and SimProbe Installed. I also have a question about the CumulusX Installation. "CumulusX Error - Default Settings reset"
I assume it has installed correctly? Just that little error message concerning me. Also, I take it I DON'T have to install SimProbe seperately as the Website indicates that the latest version is included in the latest CumulusX Install. As you can see, the rope of the Launch can be seen through the cockpit panel. You're right, simprobe is no longer needed. Please read the manual of cumulusX! It is everything described very well. Probably you just don't have the correct seeting. Normally you only need fair weather and auto thermals. The issue with the cable in the panel is a knowen issue, it is simply something you have to live with. It can't be changed because FSX works against us here. I will read the manual and that will hopefully fix my problem. Am I definitely correct in thinking that a high broken beep means pull up and slow down, and a lower slower beep means nsoe down and speed up? Also, when I pitch down and speed up, regardless of what air I'm in, the Vario will always have a higher broken beep (mean pulling up I think) purely because I have increased speed. Is this correct? I have read the DG X Manual many times over and it is detailed, but I'm still confused on a few things. Ahhm, yeah, you seem to confuse something there. You have switched it to speed to fly wich is almost useless to find thermals. So the Vario mode is much more interesting for you to find and use thermals. Speed to fly is for more experienced pilots, wich make the first longer overland flights, so start to use this later when gliding straight to the next waypoint. Thanks Joachim, I won't use STF next time then. I used it purely because (from what I could gain from the manual) that it is the most useful mode as it performs triple-compensation calculations, allowing it to simply display the speed you should fly. I'm about to do my next flight I'll report if there are any problems. I just did a flight and at last I have correct Vario reading and good Thermals! I have some more problems though - Please see below. - When I'm on the runway, the aircraft constantly rocks up and down on the banked wing. It never stays still. - I would also greatly appreciate if you could post a screenshot of the settings you've applied under the "Configuration" tab of CumulusX. The standard configuration is really good. I use it, too. Omportant in the BM is that you don't set the brake, and pull full elevator while SMOOTHLY powering up. Let the plane begin to roll at half throttle and then open it more to gain speed. Make the first tries without water. Regarding the bouncing wing: Simply try a slightly different location. I've tried 7 different locations now and I get bouncing Wings on every one of them. I'll try some more BM takeoffs also. Also, no matter what, I end up veering off the runway every time due to the wing being dipped to one side. It only pulls up very later, even with correction rudder and aileron applied. OK, first lets solve the bouncing issue. Please switch off cumulusX! If this helps tp stop the bouncing, then you didn't get the correct version. 1.6 is the current version, and can't produce any bouncing. If this doesn't help, FSX itself is the reason. This is an anoying problem for us developers, because FSX does not always do what it should, and even worse, does not always do the same! You see the numbers 0.80 in each of these lines. This is the value for damping. Strange is, that if I set a HIGHER damping on my mashine, I get bouncing. But maybe you not. Maybe 0.9 is better for your PC, or even a smaller value. One user experienced a way better result with 0.1. I know it is weird, but we can't do anything else here. Try different values. Note, that you must reload the plane after saving the cfg file. Do NOT enter values greater than 1, or smaller than 0. This messes FSX up. I can't help you here much. I can only say practise, practise, practise... I bet no user was able to launch it on his first try. Okay thanks very much Joachim I will try that .cfg fix now, and also try adjusting CumulusX appropraitely. I am getting better at BM Takeoffs! Joachim, please could you tell me where the Aircraft.cfg is located? I'm experienced in editing the .cfg but don't know where it is located under W7 64-bit. Also, I'm a bit unsure if I've disabled the FSX Thermal engine properly. The manual of CumulusX says to add ".defunct" to the end of "thermalDescriptions.xml". However, I have to file called "ThermalDescriptions.xml", just a file called "ThermalDescriptions" which happens to be an xml document. So I added ".defunct" to the end of that file. Have I disabled it correctly? There is also another file called ROOT_ThermalDescriptions but I don't know what to do here. And to disable cumulus simly clowe the cumulus program, or disable the lift in the cumulus main window. And btw, please do not quote complete posts if you answer directly below. I'm not trying to disable the CumulusX program, I'm talknig about disabling the default FSX thermal program. Please see above post for details. Is it safe to edit the damping to 1.0 for every glider model? Some good news. I have adjusted the .cfg to 0.50 on each model and the bouncing has practically stopped altogether (there is some very mild bouncing for the first 5 seconds, but I can live with this). I am still needing confirmation on the FSX Default Thermal Engine "Defunction" though. Please see post above for details. Ahh, yes, you did it right. Sorry, Misunderstood first. The reason for renaming the file is, that FSX searches for a file name. If this doesn't exist, it can't find the file at all. You could name it "CRAP.cxm" also. Great that the bouncing has gone :-) However to kill the last 5 seconds of bounce you can do some fine tuning. I may do some fine tuning then . Also, will I get any adverse side effects by adjusting the damping? Also, will I need to add "defunct" the the end of "ROOT_ThermalDescriptions" aswell? PS: Just done a very nice flight from YCUN to YBEV in Australia! Very enjoyable in the BT! you have deactivated default thermals effectively for sure, though not exactly the way as it was intended. Apparently, you have "Hide known file extensions" active, which prevents the extension ".xml" from showing up in explorer. So you have renamed "ThermalDescriptions.xml" to "ThermalDescriptions.defunct.xml" rather than "ThermalDescriptions.xml.defunct". 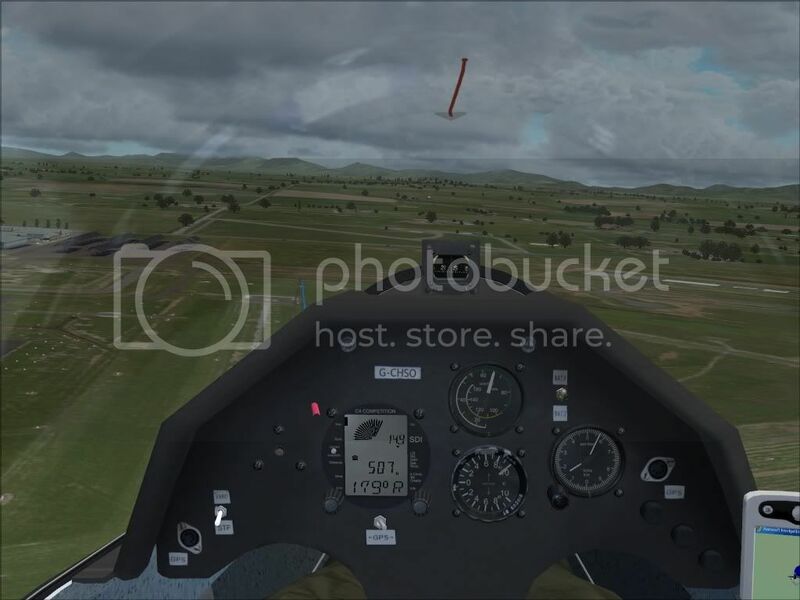 Nevertheless, this effectively hides the file from FSX likewise and thus deactivates FSX' stock thermals. So I don't need to rename ROOT_ThermalDescriptions, just ThermalDescriptions? Also thanks for your detailed reply on how I disabled it, didn't really know what I'd done! Is it reccommended to have some wind whilst flying? I want to but then FSX has some awful wind shifting issues that really annoy me. Set only one wind layer, and drag it as high as you need, or higher. Wind is always recommended, if you have some hills and mountains, where you can use the lift. Right all my problems are almost sorted then! I used a 70,000ft Winch Cable. There was a headwind of 20 knots blowing into me, with a headwind of 10 knots below. I found about 5 very good thermals which gained me quite a bit of altitude. Yet I still fell about 5NM short and had to land in a field. Am I gliding at the wrong speed (ie what is best glide speed for the B Model)? With that length of Winch Cable it should get you the 30nm no problem with or without wind or thermals On a side note, if you have a flight plan loaded then on the C4 it will tell you at what altitude to gain for that distance. Thanks James, didn't know the C4 could do that. Also, what is ideal gliding speed? This really doesn't explain how I didn't make it on 3 seperate occasions, even with good thermals and a headwind? Regarding the vario sound - rising beep-beep-beep-beep-beep is a happy sound , it means you're climbing, and in gliding the fundamental technique is to SLOW DOWN when you're in good air, so you soak up that goodness for longer. A deepening beeeep-beeeeeeeep-beeeeeeeeeeeeeeeeeeeeeeeeeeeeeeeeeeeeep is a not-very-nice sound . It means the air around you is sinking and you should SPEED UP A LOT to get out of this crappy air. After a week-long real gliding competition, you hear these sounds in your dreams. In the 'vario' setting (switch up) the sound really is telling you whether you're climbing or sinking and in a straight-line *cruise* you have to judge how much to speed up or slow down. In the STF (switch down) setting the sound is kind of adjusted around the dial to take into account how fast you've said you want to fly via the 'Mccready setting', and now it really means speed up or slow down. What's wierd about it all is if you are in crappy (i.e. sinking) air, and coming down like a rock, the vario (on either setting) will be yelling buuuuuuuuuuuuuuuuuuuuuuuuuuuuuuuuurp meaning "speed up out of this crappy air", but speeding up will make you come down even faster, which doesn't feel right at all. But it *is* right, it pays to get out of sinking air at high speed - the increased speed will use up some height, but not speeding up would leave you in the sink longer and this is *much* worse. And yes, absolutely 100%, if you want to have some really enjoyable flying, set some wind (e.g. 15 knots from the NW) and *ridge run* along some suitable ridge aligned across the wind (e.g. take off from Mifflin Airport, PA). For ridge flying the netto vario reading indicates the updraft on the glider, and you can fly along the ridge for hundreds of miles at 100 knots +. You have to slow up every time there's a gap in the ridge, and the lift is great for ridge running but typically becomes not so great if you stop and try and turn in it. The best glide ratio in a ballasted Discus is at around 60 knots, 40:1, i.e. you're coming down at 1.5 knots. If you were flying at 60 knots, and descending at 1.5 knots, then with the headwind of 20 knots you'd actually be moving forwards over the ground at 60-20 i.e. 40 knots (but still coming down at 1.5). So your effective glide angle will be 40/1.5, i.e. a glide ratio of 26 (for each 26 miles flown, you'll come down one). So on a 30nm final glide, you'll come down 30/26nm, i.e. 1.15nm, i.e. about 7000 feet. So with no lift or sink, and into a 20 knot headwind, you'd need to be at least 7000 feet higher than the destination airport to get there from 30nm away. It would be normal and sensible to add 1000 feet to this at the start to have real confidence in making the destination. Note this is the height AGL at the *destination*, because that's where you're headed. Max winch height in the real world is *maybe* 2000 feet AGL, excluding record attempts, so if you want to test this final glide, try slewing up to 8000 feet AGL and doing it. As Joachim says, if you put in a simple flightplan with the correct destination, then the C4 will continuously display your calculated arrival height *MSL* as you progress into wind.